You'll be £19.99 closer to your next £10.00 credit when you purchase Crown Covenant and Cromwell. What's this? Crown, Covenant and Cromwell is an important new military history of the Great Civil War or rather the last Anglo-Scottish War as it was fought in Scotland and by Scottish armies in England between 1639 and 1651. While the politics of the time are necessarily touched upon, determining just how a battle was won or lost is often just as important as unravelling the underlying reasons why it came to be fought in the first place or the consequences that followed. Here, Stuart Reid, one of Scotland's leading military historians, brings the campaigns and battles of those far-off unhappy times to life in a fast-paced and authoritative narrative as never before. In doing so he exposes the very human story of those armies and the men who marched in them. Due attention is paid to the actions of the generals in whose name many battles were won or lost including Alexander Leslie, the illiterate soldier of fortune who became Earl of Leven, James Graham, Marquis of Montrose and of course Oliver Cromwell, the fenland farmer and Lord Protector of England. However, Reid also examines the extraordinary stories – from the heroic and tragic, to the cowardly and the absurd – of many of the ordinary men taking part in the fighting. This book sheds welcome new light on what to many are very obscure corners of the Civil Wars and will be essential reading for students of the period. Reid's analysis is considered carefully, and the author should be commended for never losing sight of the fact that this is a period of truly devastating warfare, disease and depredation. Moreover, for bringing together what are increasingly (and lamentably) obscure, yet undeniably important, battles to public attention, the author should be applauded. Some 25 years ago, the epicentre of study of the 'English' Civil Wars was not Cambridge or Oxford, but Leighton-on-sea in Essex. It was from here that David Ryan and Partizan Press brought the talents of a new wave of researches to a wider audience. Among them was Stuart Reid, who probably did more than anyone else to bring the Ciivil War in Scotland out of the shadows. He is now regarded as the expert on Scotland during the Civil wars, and Crown, Covenant and Cromwell is his latest study. In it, Reid tells the story of what he calls the 'last Anglo-Scottish War', the wars fought in Scotland and by the Scots in England between 1639 and 1651. This is a very good assessment of the Scots armies during the Civil Wars, a subject commonly overlooked. This is a military history, and Reid does his best to not let the politics get in the way. The highlight of the book is Cromwell's invasions of Scotland in 1650, which culminated in what should have been an English defeat at Dunbar, but instead turned out to be Cromwell's greatest victory. Reid re-examines the campaign, arguing that instead of neutralising the Royalist threat north of the border, Dunbar in fact made it a reality. The phrase "don't judge a book by its cover" can seldom have been more apt. 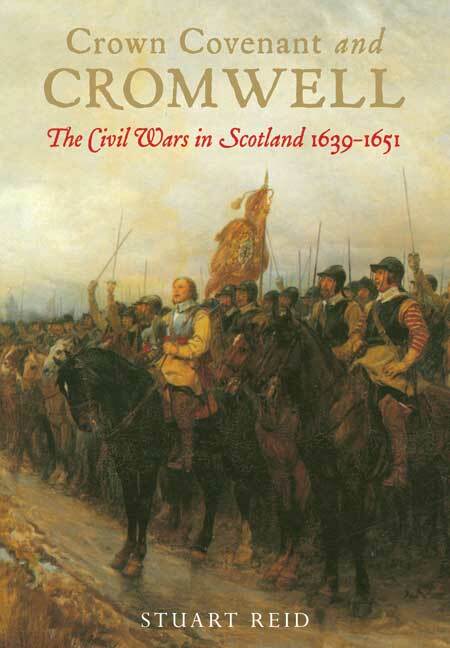 The front cover of "Crown Covenant and Cromwell: The Civil Wars in Scotland 1639 - 1651" by Stuart Reid shows part of a painting by the artist Andrew C. Gow entitled "Cromwell Prepares to Fight the Scots at Dunbar". It is, therefore highly relevant to the subject, as the Battle of Dunbar is given detailed treatment within the book. Unfortunately the end result is a truly dreary cover. Stop right there, and look again: only a little more carefully this time. What Stuart Reid has produced is a wonderfully researched, highly authoritative and extremely well written account of the military side of the conflict that swept across Scotland, and involved Scots troops in England, in the years between 1639 and 1651: a conflict the author refers to as the Great Civil War, and which formed part of what are sometimes called the Wars of the Three Kingdoms. Many books have been written about the story of this extraordinarily complex period from the point of view of the political or religious issues that arose. Stuart Reid makes reference to this background, but his focus is very explicitly on the conduct of the battles themselves, and the actions of those directly involved. This book should be considered essential reading for anyone with an interest in the history of the period.